I'm often asked what I call the kind of music I make. Those who see me perform regularly - many of them musicians - remain without an answer, although one listener calls "Lovegrove-Music" it's own genre. 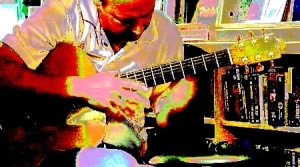 A little grand for my tastes, but the phrase "contemporary fingerstyle guitar", my default response - a genre well established since the 1980's - is too bland and data deficient to give listeners an image to relate to, and so solo instrumental steel string guitar music which incorporates some or all of: "alternate" tunings; two handed fretboard work; percussive techniques; and compositional freedom; in addition to a broad array of conventional fingerstyle techniques, escapes easy classification. Although some players bring this range of techniques to music related to historical genres (American roots, blues, folk, Celtic, Irish, etc.) the distinctive thread remains with a new "style" of music which is harmonically, melodically, compositionally, and technically distinct from traditional musical styles. More than thirty years after it made its appearance a satisfactory name for this style has not been found. I hope and think that my music is a distinct manifestation of my world-view and way of thinking, a distinct "voice"as the phrase goes,with all the strengths and weaknesses involved, and hope that other's might find some value in that. It may seem curious that I should have developed my playing and composing to the level they're now at and yet lived half a lifetime before ever writing a complete song (with the exception of one tune) or really performing for anyone except myself. As a young boy, sitting on the front porch steps at home one fine day, I watched a man walking, curiously, down our suburban street with a curious suitcase-like thing held by one hand, who then curiously walked up our driveway, then up the walkway to where I sat. This door to door salesman for guitar lessons introduced himself to me. I went inside to fetch my parents, and so the gentleman was invited inside where he proceeded into his curious pitch, which involved retrieving an accordion (!!!) from the case. "Curiouser and curiouser!!!" Purportedly my attempting to manipulate the accordion would yield insight into the prospect of my having facility with a guitar!! Unsurprisingly, I qualified for the group classes. After the DTDS departed my parents asked me whether I'd like to learn to play guitar, and if I would so like, then they'd find me a private teacher. 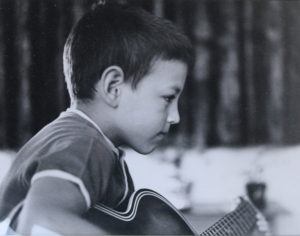 And so I began taking private guitar lessons which continued through to my mid-teens, and a pursuit which has provided, in my own solitary fashion, so many personal rewards, for I'm one of those people for whom music is elemental. Over a span of many years I played solely for myself and my personal pleasure. I began playing in alternate tunings while in university and almost exclusively improvised in numerous tunings over the ensuing years, rarely working on other people's tunes nor composing tunes out of my improvising. Consequently many years of good musical ideas and "semi-compositions" were lost as new improvisations continuously displaced old ones. Over the years I almost inevitably developed my own fingerstyle techniques and tunings and a distinct voice based upon them. Listeners often refer to images, especially of the natural world, to explain their experience of my music. In 2009 I was suddenly afforded much more free time, and so I began to play the guitar much more, and I began composing finished tunes. They seemed worth sharing, so I began performing publicly. 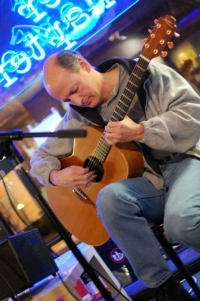 A growing repertoire of original tunes has steadily amassed and my playing has evolved alongside, with new techniques and capabilities added regularly. A backlog of material awaits recording. And now, in year 2013, I've finally been able to make a first recording, hopefully the first of many despite a late start. Cheers, and enjoy the music as you may, for what comes out of my hands is now out of my hands!